Software Instructions will be provied in browser after payment. 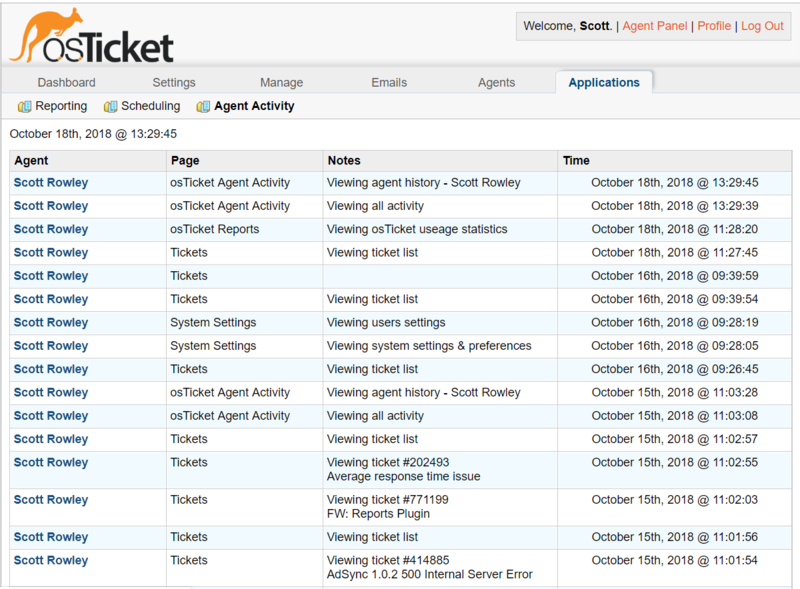 The Agent Activity plugin for osTicket allows you to easily monitor agent activity. Easily view agent history by clicking on any agent name. This powerful monitoring tool integrates seemlessly utilizing the new (and mostly undocumented) Plugin architecture of osTicket to provide a better more polished product. Gone are the days of modifying the source code to install custom modifications for osTicket. Plugin is developed and running on osTicket 1.10+ branch. Over the years we've gotten many requests to trial our products. To facilitate these requests we have setup a demo site.